The Pallet Locker is another exclusive storage product in our container line up. This revolutionary new storage container will change the way you transport and store your product securely. 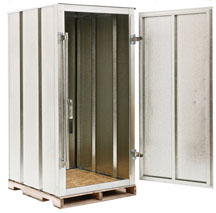 Constructed of heavy-duty 18 gauge corrugated galvanized steel, the Pallet Locker is designed and built to last. Pallet Locker is the perfect solution when you require economical, tamper proof, secure storage for your valuable items. Pallet Locker is lockable so you can be certain of tamper free, secure shipping and storage of expensive items. As well, it is the perfect solution for private, sensitive information like file storage, legal files, financial records and customer or employee records.